At an event today in San Fransisco, Google announced a new service that will offer streaming results for searches, incorporating real-time updates from web pages and social networking partners. It will be rolled out over the next couple of days. 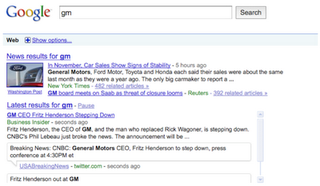 The new search mode comes with partnerships Google announced today with Facebook and MySpace. Feeds from both sites, along with Twitter comments, blog postings, and other web sources will be rolled into Real Time results page for up-to-the-second updates. They've also added a "Hot Topics" section to Google Trends to show the most common topics people are writing about at any given moment. Other news from today's event includes Google Goggles, which lets you search via any picture you take with your phone, and an automatic translator that lets you speak English into your phone and have it translated into Spanish in, again, real time. The translator should be available in 2010, and Goggles can be tried now in Google Labs.